Located later in this article is a summary of the single family housing starts for each MSA and the non metro areas in the State of Florida. As we have in the past reports, I focused on the single family starts as it provides a better reflection of the overall residential trends and a glimpse into the health of the state regionally. I added a map which shows the regions of the state and the change in housing starts from Year End 2010 to 2011. On the map, the dark red represents those MSA’s which have seen a less than negative 10% contraction in permits, with the dark green representing those MSA’s which have seen an expansion of more than 10%. The state had a significant surge in single family housing starts in the 1st quarter of 2012, up over 25% from the same prior year. Multifamily starts on the other hand were down 2.5% when compared to the same period last year. The increase in overall MF starts in 2011 has translated to a reduction in new MF product starts in the first quarter of 2012. This would suggest the MF market may have added sufficient units or possibility a surplus of units to accommodate the current and future demand. Single family product continues to the demanded design for most markets. For the 1st quarter of 2012, the areas of largest expansion were concentrated in the employment based markets of Miami-Ft Lauderdale, Orlando, Tampa and Jacksonville, which together accounted for almost 55% of the state’s housing starts. Southwest Florida accounted for 14% of the permits, while the Panhandle accounted for an additional 6%. The remaining 25% were dispersed among the non metro counties (13%) and other smaller markets. The Panhandle saw fewer starts in the 1st quarter as this is the off season, however seasonal markets in southwest Florida saw a significant increase in starts. Located below is a summary of the single family housing starts for each MSA and the Non-metro areas in the State of Florida. As we did last quarter, I focused on the single family starts as it provides a better reflection of the overall residential trends and a glimpse into the health of the state regionally. I added a map which shows the regions of the state and the change in housing starts from 3rd Quarter YTD 2010 to same period 2011. Overall, the states single family starts are up approximately 3% from the same period last year. This is consistent with the small increase in overall population and employment. On the map, the dark red represents those MSA’s which have seen a less than negative 15% contraction in permits, with the dark green representing those MSA’s which have seen an expansion of more than 15%. The main areas of contraction are the Gainesville and Ocala MSA’s, along with the space coast area south of Jacksonville and east of Orlando. The slowing employment of the space program is the main factor affecting the starts in the space coast area with excess inventory affecting the Gainesville and Ocala markets. The employment based markets of Orlando, Tampa and South Florida have seen solid expansion in 2011. Jacksonville has seen a slight contraction in SF starts, however saw an increase in Multifamily starts this year over last. 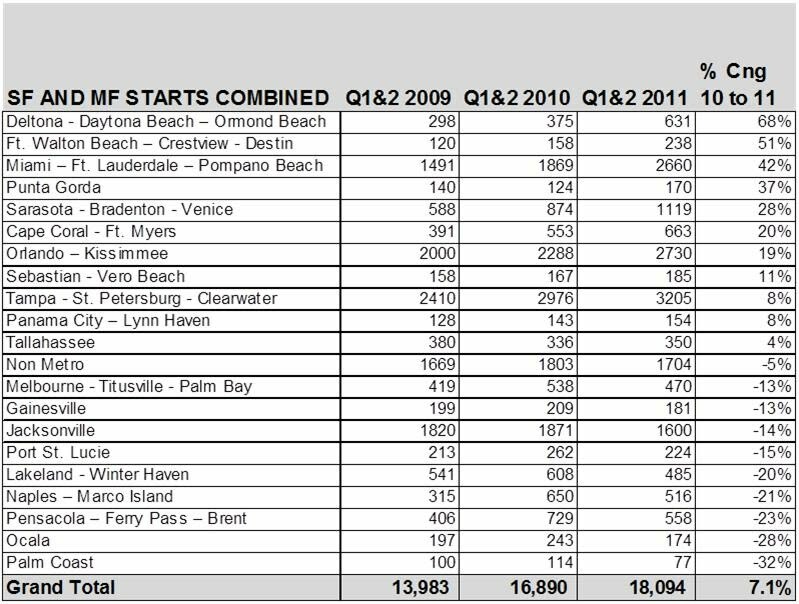 The tourist based MSA’s of Destin, Ft Myers, Naples and all of south Florida have seen solid increases in starts. This is primarily due to the rapid sales volume which exhausted much of the inventory of these markets, and the fact the second home markets which feed these areas still look at them as good values. Located below is a summary of the single family housing starts for each MSA and the Non metro areas in the State of Florida. In reviewing the data, I decided to include only the Single Family starts as it provides a better indicator of the growth for the markets. The introduction of a significant number of multifamily units in the 1st quarter in selected markets skewed the trending. I will discuss the Multifamily starts by market to round out the data. The 2nd Quarter summary shows a comparison over the past 3 years, with the YTD over YTD overall increase of -4.1% for the second quarter of 2011. Many of the seasonal based markets are seeing increases in housing starts, including Destin, Vero Beach, Ft Myers, Naples and Sarasota. The large employment based markets of Miami and Tampa are seeing increases over the 1st half of 2010, with Orlando and Jacksonville seeing significant SF starts, however are seeing more MF start activity. The Panhandle areas of Destin and Panama City are seeing health increases over 2010. Southwest Florida is also seeing solid increases over 2010. The MSA’s which saw decreases from 2010 have existing inventory from 2010 to be absorbed which is the reason for their slower activity in the 1st half of 2011. Some areas like Jacksonville, Miami and Tampa had significant multifamily start activity which is reflective of the employment based nature of their economies. I have included the data for Single Family and Multifamily Starts combined below this chart.